We live in a condition of cultural translation - between migrations, occupations and multiple inhabitations. Like Vilém Flusser’s exile, we must “process” the data, as a matter of survival. Flusser tells us that this “data transformation is a synonym for creation”, so that the exile becomes “a catalyst for the synthesis of new information”. Cultural translation is never literal: this ‘data transformation’ doesn’t involve the direct transfer of meaning. Instead, we think of translation as different sensitivities and mingled ambiences. It emerges as a field of partial meanings, sounds, smells and dissonant textures. This understanding of translation has a potential to open up practices that go beyond cultural representation. One productive aspect of this field could be what Sarat Maharaj has called “creative mistranslation”: the idea that (mis)translation can create a surplus of meaning that generates a new consciousness, even a "transfiguration". Art, as a domain for the displacement and circulation of meaningful objects, is the field where cultural mistranslations become a productive force, a breeding ground for hybridity and new cultural configurations. This interdisciplinary residency explored the potential of translation and mistranslation in the context of displacement (of objects, sounds, ideas, as well as of people). How does one culture play a role in another culture? And what happens when the products of creative mistranslation are brought back to the scene of ‘expulsion’? The residency was developed with Smadar Dreyfus (IL) who was invited by PRAKSIS and Kunstnernes Hus. Smadar Dreyfus, Short preview of School, 2009-11, multi channel audio visual installation, duration 7 x 26'30"
Shown here is a short preview of School (2009-11), arguably Dreyfus’s most complex project to date. Shown at the 2011 Folkstone Triennial and at Haus der Kulturen der Welt, Berlin, 2014, School unfolds across seven rooms connected by a central corridor, each one containing a spatial audio recording of a different lesson at a Tel Aviv secondary school. The subjects taught include Arabic, Bible Studies, Biology, Citizenship, Geography, History and Literature, each sound-space subtly hinting at the political and cultural pressures shaping students’ and teachers’ approaches to learning. Further examples of work by Dreyfus can be found here. Established in 1930, Kunstnernes Hus is Norway's largest gallery under the direction of artists. It serves as major center for exhibititions of Norwegian and international contemporary art. Residency leader, Smadar Dreyfus (IL) worked with the PRAKSIS team to select a residency community of six residents to work alongside each other in Oslo, including: Vibeke Frost Andersen (NO), Johnny Herbert (UK), Tze Yeung Ho (NO), Ebba Moi (SE), Line Sanne (NO), and Merve Unsal (TR). Once again, the panel had incredibly difficult selection choices to make, and only wish it was possible to host more participants. In a pitch black space at Kunstnernes Hus, Smadar Dreyfus gave an atmospheric performative talk about her work, sending sound to the audience from around the room. This was followed by an in depth lecture on the subject of cultural translation from philosopher Stefan Nowotny. Stefan Nowotny delved deeper into the residency theme through an 8 hour workshop. 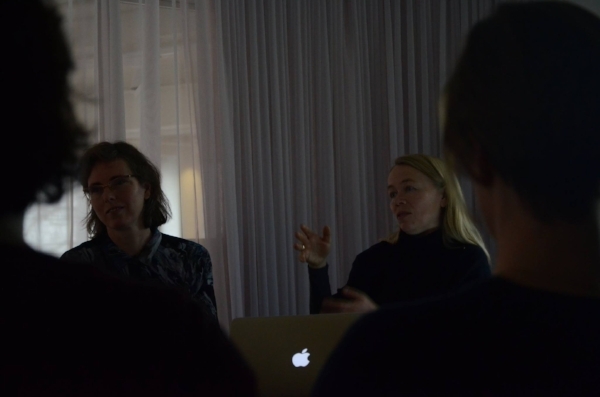 Oslo based artists; Yngvild Færøy and Søssa Jørgensen, Helle Siljeholm, and Martin White discussed their practices with the residents and member of the public. Through a public lecture and full day workshop, Behzad Khosravi-Noori explored the notion of translatability in relation to state apparatuses and connected to hyper-politicization from an individual level through to the structural in artistic praxis. Trond Reinholdtsen (Associate Professor at the Norwegian Academy of Music) joined the group to discuss issues of translation in relation to his practice as a composer. Alongside the planned events and self led research, the residents kept busy: attending several large symposiums, weekly meals with invited guests, film screenings, visits to exhibitions, and a visit to Guttormsgaards Arkiv.